Ask fellow campers about "Perkins Creek RV & Campground, LLC" and nearby attractions. We had an easy back in site with electric and water. We could have moved to a pull-through the next day but we loved our spot. We stayed over a week and got the weekly rate. They have a complimentary dump when you do that and the camp owner dumped us. He also delivered us firewood. There is no wifi but they have excellent wifi in Clatskanie about 2-3 miles away. We missed the elk in the large open field because we were sleeping, but Mrs. owner tried to call us and tell us about it, though we had our 'do not disturb' turned on. The Clatskanie River was not far from our site, though not visible, but we could hear it whenever we were outside. We had a picnic table and a fire ring. The bathrooms were some of the cleanest we've used. The owners were very personable and friendly. We never saw anything but kindness from them the 10 days we stayed in their park. The previous report seems to be completely out of character for them. It is a family friendly park and they don't charge you the extra over 2 people unless you obviously are more than one family. We camped at Perkins Creek RV & Campground, LLC in a Fifth Wheel. This is centrally located for day trips to Astoria, Seaside and Cannon Beach to the west and to Mt. St. Helens and Portland to the east and southeast. The local town has places to eat, a library with great wifi, a laundromat that is reasonably priced and grocery stores. The campground is very private and was not busy the end of September when we stayed. It is in a little valley and quite beautiful. Our hosts were so welcoming and gracious. We felt comfortable and safe. A little slice of heaven. Located just outside town and about 30mins to the coast with access to some great restaurants too. Ixtapas for mexican and Fultanos for pizza, burgers, etc. Or just stay by your campfire. Or walk the 30+ acres. This is our favorite campground. We camped at Perkins Creek RV & Campground, LLC in a Travel Trailer. Check out Flowers and Fluff for yummy coffee drinks and more. Ixtapas for tasty Mexican. Save room to try the sopapillas with cream and Carmel sauce. Fultanos has fabulous pizza plus more; and, they also have specials so call for when they have all you can eat pizza bar. Such a friendly town. Arrived at the park in the evening. The park was easy to find and spaces are nicely sized and easy to access. Sites are gravel with grass and a picnic table. On the fourth day the camp hosts were drunk and became violent. The husband was throwing the f bomb around like it was the best word he ever heard of. I cannot recommend Perkins Creek RV park to anyone. The location is 2 miles outside of town so very quiet. Unfortunately the camp hosts at this place have ruined it. We camped at Perkins Creek RV & Campground, LLC in a Fifth Wheel. Quiet place a couple of miles off Hwy. 30 , used as a Christian retreat & was told as many as 500 people could be there. But there's a private upper campground I believe they use. But when I was there I was the only one in a water & power site #3. All the Trailers were at the other end of the park across the field in the full hook ups that were $25.00 a night. Path to a beautiful creek with swimming hole with lots of places to let the dog run. PEACEFUL is this private hide away - I will be back! We camped at Perkins Creek RV & Campground, LLC in a Motorhome. Like the other review says, this is where you go to disconnect and not be bothered. My family isn't Christian, but aren't bothered by this being a popular retreat for Christian campers. We look forward to making another trip here so we can watch the stars and our dogs can run through the huge open meadow and splash in the creek. Our daughter loved throwing rocks in there. If you like tent-camping, this is only a baby step "up." This is a rustic area, so you need to watch out for kids safety. We have a lot of fond memories of this park and the little town it's near. The only caution is the road getting there off the main road is very windy. So take it very slow for a couple miles and don't worry about cars backing up. We camped at Perkins Creek RV & Campground, LLC in a Motorhome. The only thing keeping this place from getting a 10 is that at certain times of year they are home to a Christian retreat, and if you're not comfortable with a lot of religious Kumbaya, then you won't want to be there during those times. Otherwise, this is my favorite place to go. They make sure you know there cell reception is nil and there is no Internet or TV. This is a place to go to disconnect. It's all rustic. The bathrooms aren't fancy, but if you check the website, you'll realize what you're getting. There's a huge meadow that's great for dogs and kids and for watching the stars. Next time my husband has a week off work, we're going back. Since this place is remote, it's not one to stay at long-term, though I think you can. There are some small stores about a mile away, but that's it. It's nice and quiet and I can't wait to go back. We camped at Perkins Creek RV & Campground, LLC in a Motorhome. We chose this park for two reasons only. It was close to Hwy 30 to Astoria, Seaside, Cannon Beach along Hwy 101. We also drove to Mt Saint Helen's and up the Columbia River east of Portland. A very rural setting, parked in a field with tall trees behind us where we could not get cell service, satellite service or tv service so we went to the thrift store in town and bought a couple of movies. We think the owner caters mostly to church groups since one was there in the RV section on the property. We never saw that area. We had H20/30 amp electric and drove to the bathhouse to shower which was clean even though there were a lot of grown-ups & kids using it. We saw no washer/dryer facilities. As you drive into the park you will cross a bridge over a creek. The nice owner, brought us a trash can and outdoor table. We parked here in a 40ft motor home for 2 nights at $30 a night which we thought was high. We camped at Perkins Creek RV & Campground, LLC in a Motorhome. 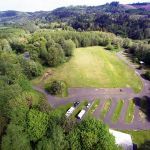 This RV park allows tent camping if you are a cyclist. Ken and Diana are wonderful and really seem to enjoy having cyclists stay over. The facilities are immaculate, and the showers are hot and strong! Just what we needed after our ride! We are trying to have them added to the ACA maps for other cyclists. Great restful place to stay! We camped at Perkins Creek RV & Campground, LLC in a Tent. This hidden gem is between Kelso and Astoria and we found it in Trailer Life Directory. Figured it would be a jewel or a bust...we were elated to find it so nice. It is about two miles off the highway on a paved road and sits down in a valley, along side a beautiful salmon stream. Totally quiet. The owners work at making you happy and comfortable. Spaces are huge with good hookups. Shady or sunny sites. Back ins back to stream. Have a very large grassy meadow for ball games, etc. Baths and showers are old, but very clean with great hot water. At dark, it is pitch black and QUIET. Rate was $25.00 including tax. This is a sleeper...so it you like peace and privacy...go here! We camped at Perkins Creek RV & Campground, LLC in a Travel Trailer. Are you affiliated with Perkins Creek RV & Campground, LLC ?